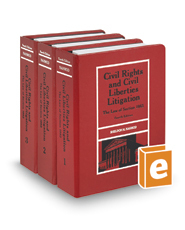 Civil Rights and Civil Liberties Litigation: The Law of Section 1983, was the first ever – and is widely recognized as the leading – treatise on the subject of litigation under Section 1983. It provides comprehensive and up-to-date coverage of all Section 1983 issues, and includes the insights of its nationally known author, Sheldon Nahmod, professor of law, lecturer, and Section 1983 consultant. The treatise is regularly cited by the Supreme Court and other federal courts, as well as in briefs and law journals. Importantly, it discusses Section 1983 issues from both the plaintiff's and defendant's perspectives, and sets out the substantive law for Section 1983 claims, whether brought in federal or state court. The treatise is updated annually by the author and contains the most complete discussion and collection of Section 1983 cases anywhere. The 2018 update to the Fourth Edition includes not only recent important circuit court and state court decisions, but all § 1983-related decisions of the Supreme Court that were handed down, up to – and including – its 2017-2018 term.